Daniel Mills is a master of telling tales set in pre-20th century New England. His previous novel, Revenants: A Dream of New England (2011), takes place in the late 1600s, and his short story collection The Lord Came at Twilight (2014) is chock full of period-set tales. 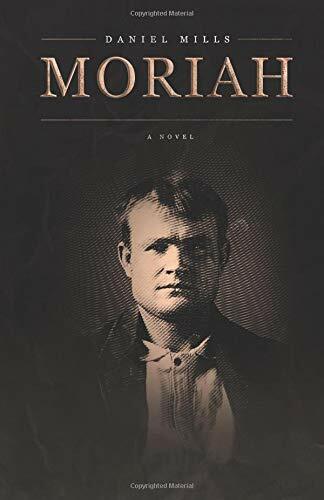 So it is that with Moriah he sits the reader down for a tale set in Vermont in the years following the Civil War—a tale of secrets, lies, and ghosts. A minister and former army chaplain turned journalist named Silas Flood has traveled to the mountain town of Moriah to cover a most unusual story: two brothers, Thaddeus and Ambrose Lynch, who apparently communicate with the spirit world. It’s not long, however, that ghosts of a different sort begin to manifest in the narrative—those of Flood’s tragedy-strewn past, both in the war and in the life that he’d left behind, as well as those of the people he meets in Moriah. What’s most prominently on display in this book is Mills’ strong, heavily evocative prose. Such exquisite care was taken to render a sense of authenticity to the very particular style of language, both in dialogue and in the overall narrative, for characters living in the shadow of war-torn America in the late 1800s. “Mrs. Ambler exhaled and settled back against the chair. She said: ‘My aunts were superstitious women, Mr. Flood. Mary, the youngest, was frightened of storm sand the evil eye, while the oldest, Rose, used to tell me ghost stories. She never married, but I gather she was once engaged to a sailor—one of many who went to sea and did not return. The stories she told me were so vivid, so detailed, that I used to wonder if they had truly happened if she knew . . . I do not wonder anymore. “‘What, exactly, do you believe she understood? Every page—and, indeed, every paragraph—is clouded with an overarching sense of melancholy. Although this mood is powerful, it is never overpowering; instead, the focal point is always on the interactions and reactions of the cast of broken characters. Moriah is told in an epistolary fashion; although it is mainly Flood’s tale, there are several chapters told from Thaddeus’ point of view, interspersed with journal entries from Ambrose (beautifully illustrated to look like handwritten notes on crumpled sheets). As a result, not only Flood’s past that slowly gets drawn into the light—the Lynch family is a host of tragedies, secrets, and skeletons piled in closets. Some readers may be a bit overwhelmed by this book’s combination of historical and narrative styles, but then Mills thoughtfully utilizes these qualities to appropriate degrees, and the results never come across as superfluous or exploitative. As an added treat, in the acknowledgements page at the end of the novel, Mills shares some fascinating details regarding the inspirations behind the tale, including a pair of very real brothers who practiced as mediums in Vermont in the late 1800s. Although not quite a horror novel, nor even an outright ghost story in the classical sense, Moriah is nonetheless a story about people being haunted by ghosts. Melancholic and mesmerizing, this book will stay with readers long after they finish, and further cements Mills as a name in fiction to read and revere.